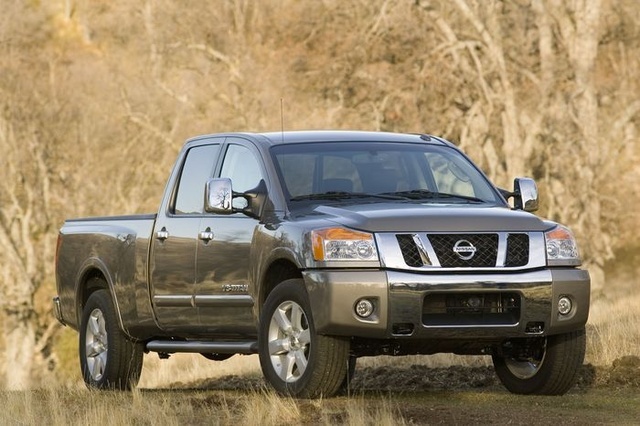 Nissan launched the Titan in 2004, aiming at the last bastion of the American automobile market: the pickup truck. In 2008, the Titan has yet to capture that market, but it has taken some market share and received critical acclaim with this model year's refinements. Only one powertrain is available in the Titan lineup: a 5.6-liter DOHC 32-valve V8 that produces 317 hp with 385 ft-lbs of torque coupled to a five-speed automatic transmission with Tow/Haul Mode. Rear-wheel or four-wheel drive is available across all trim lines, except on the PRO-4Xs, which are available only with four-wheel drive. Reviewers give the powertrain thumbs-up for performance, with the 0-60 jump done in 7.2 seconds. However, they are unimpressed by the Titan's gas mileage - Nissan estimates 12/17 mpg for all trim levels. The Titan receives high marks for handling, with an independent double-wishbone suspension and anti-roll bar in front and a multi-leaf suspension with a solid Dana rear axle rated effective on all types of road surfaces. Grabbing the steering wheel, one reviewer found "precise, linear steering and nicely weighted effort to make the truck relatively nimble and easy to drive quickly on pavement." The Titan also impressed with its "strong and stable" four-wheel antilock disc brakes. All-wheel-drive Titans come standard with a brake-activated limited-slip traction control system. A switch-activated two-speed transfer case is optional. Reviewers like the system, but criticize the need to stop the truck to shift into heavy-duty low-gear range. The all-wheel-drive system adds Dana axles to the front. There are two basic cab configurations, and each is available with two bed lengths. The King Cab can be ordered with either a standard (79.1 inches) or long (98.8 inches) bed, while the crew cab can be ordered with a different standard (67.3 inches) or long (87.0 inches) bed. The long bed configurations are the big news for the 2008 Titan, and they are set on 20-inch-longer wheelbases. Nissan is trying to improve the vehicle's appeal in the full-size pickup truck market. Along with new interior designs, Nissan has also added a new trim line - the PRO-4X - to provide a dedicated off-road vehicle in the Titan lineup. These trims feature an electronic locking rear differential, a lower final gear ratio, Rancho off-road shocks, skid plates, and unique interior trim. According to Nissan, the rear-wheel-drive King Cabs with the long bed option can haul 1,725 pounds, and the all-wheel-drive versions can haul 1,650 pounds. Rear-wheel-drive Crew Cabs with the long bed can haul 1,762 lbs., and the all-wheel-drive versions, 1,582 lbs. The Titan hauling champ, however, is the rear-wheel-drive Crew Cab with the standard bed, which can haul 2,063 lbs. Towing capacity ranges across the trim line from 6,500 to 9,500 pounds. Titan interiors are upgraded for 2008, yet many reviewers still find them lagging behind their American competition. While they find the Titan interior comfortable, they criticize the quality of the materials as being "rather plasticky." They are, however, happy with the generosity of the storage in cabin compartments, especially the oversize center console. Seating is favorably reviewed. Titans can be equipped with either all bench seats for six-person capacity or captain's chairs in the front, which reduce capacity to five people. The SE, PRO-4X, and LE trims' front-row captain's chairs have lumbar support and other adjustments. Reviewers are impressed with the "exceptional" rear leg and shoulder room in the Crew Cab configuration. The King Cab, however, squeezes 6-footers sitting behind a moderately tall driver. Overall, the Titan receives high marks and positive recommendations from reviewers. What's your take on the 2008 Nissan Titan? Have you driven a 2008 Nissan Titan? 2008 Nissan Titan Won't Start. Crank. No start. In limp mode. Can't pull any codes with code reader. 4x4, abs, slip lights on. What's the deal? When I turn off heat from defrost position it used to make a popping noise. Now it just doesn't blow anything, not heat or cold.